Costco is a chain of membership warehouses, and also offers many meal options to choose from at its food courts. Items include desserts, sandwiches, hot dogs and even pizza. One option for lunch or dinner is a Caesar salad, with or without a grilled chicken breast. A Caesar salad at Costco is made with romaine lettuce, Caesar dressing, croutons and an option to have a 4-oz. grilled chicken breast served on top of the salad. The salad with chicken weighs 20.5 oz. ; without chicken, it weighs 16.5 oz. This amount is considered one serving on the nutritional label. Costco's Caesar salad without chicken, but including the dressing and croutons, yields 498 calories, 50 g of fat, 16.83 g of carbs and no protein. With chicken, the salad has 756 calories, 61 g of fat, 33 g of protein and 16.83 g of carbs. The chicken itself contains 258 calories, 10.4 g of fat, 33.3 g of protein and no carbs. If you're watching your calorie and fat intake, you can order the salad without croutons and with only half the amount of dressing. This yields 82 calories, 24.6 g of fat, 17 g of carbs and no protein. With chicken, this serving has 340 calories, 35 g of fat, 17 g of carbs and 33 g of protein, according to the My Fitness Pal website. 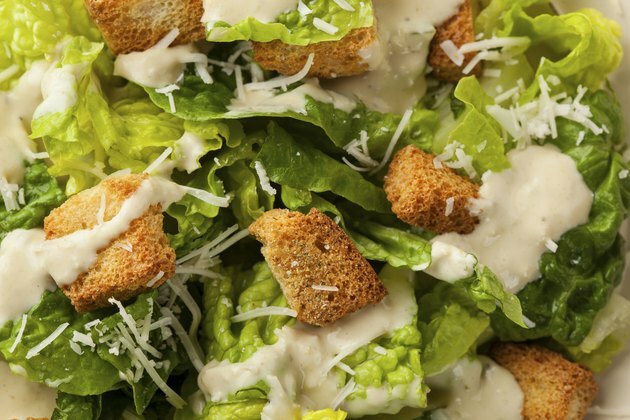 For a great source of protein with the lowest amount of calories, fat and carbs, opt to have the Caesar salad with the chicken breast and no croutons or dressing. This provides only 268 calories -- 10 from the romaine and 258 from the chicken -- 10.4 g of fat, 33 g of protein and no carbs. Romaine lettuce is a great source of vitamin A, folate and fiber, all nutritionally important in your daily diet.